The Novalis Tx is a powerful radiosurge ry system that offers a versatile combination of advanced technologies for the treatment of tumors and other anatomical targets. With the Novalis Tx radiosurgery platform, UCLA offers state-of-the-art, non-invasive treatment for a wide range of malignancies and other potentially debilitating conditions, without harming nearby healthy tissue and without involving traditional surgery. Novalis Tx is equipped with Varians RapidArc radiotherapy technology. The Novalis Tx platform includes three imaging modalities for pinpointing the tumor and positioning the patient with high precision – an On-Board Imaging device (OBI), ExacTrac room-based image-guidance system provides continual imaging during treatment to detect movement and support robotic adjustments in patient positioning in six dimensions, and electronic portal imaging device (EPID). These methods allow for protection of surrounding healthy tissues while enabling clinicians to concentrate higher, more effective doses on tumors. The Novalis Tx radiosurgery system delivers non-invasive, shaped-beam cancer treatment that takes just minutes. Novalis Tx radiosurgery treats cancerous and non-cancerous conditions of the entire body with one-of-a-kind shaped-beam technology. Shaping the beam precisely to a patient’stumor ensures that the best possible treatment dose is delivered while healthy tissue is protected. The most sophisticated tool available in the world for the delivery of Stereotactic Radiosurgery. This technology allows your radiation oncologist with an unprecedented ability to precisely focus, aim, and deliver very high doses of tumor-killing radiation to a target with minimal surrounding tissue damage, all in a fraction of the time required with other machines. As one of the most advanced cancer treatment options available, Novalis radiosurgery is changing the face of cancer treatment, and has already helped thousands of people continue to go to work, spend time with family and friends, and take part in their favorite activities, all while fighting cancer. Novalis Tx radiosurgery technique shapes the radiation beam to match the exact contour of the tumor or lesion, thereby ensuring that maximum prescribed dose of high energy radiation is delivered to the entire tumor. Employs a wide range of treatment modalities, ensuring you receive the best treatment for your individual case. 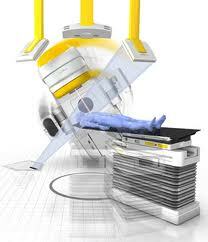 Other radiosurgery devices are limited to only one treatment modality. Delivers the industry’s highest dose rate, penetrating deeper to treat tumors previously considered untreatable. Delivers treatment in as little as 15-20 minutes providing a more comfortable treatment experience when compared with other radiosurgery treatment options. Reduces the likelihood of body or tumor movements, ensuring that treatment is delivered with the highest possible accuracy. Frameless radiosurgery offers you a more comfortable and non-invasive alternative to other radiosurgery systems which require immobilization with a head ring that attaches to the skull.